Work From Home Warnings Kill Binary Review: Yes, That’s Our Goal. Kill Binary Review: Yes, That’s Our Goal. Rating: 1 Our lowest possible rating. The Good: If you watch the full sales video, you can have a good laugh at the poor acting. The Bad: Everything about this systems is a con, from the actors to the guarantees. It's a cleverly designed scam to get you to deposit money into a brokerage account. The scammer takes half and you're left with software that gambles away all of your money. When you lose a bet, you lose it all. When you win, you win 70%. And they make it nearly impossible to withdrawal any winnings. Not that it matters because you won't win anything. The Bottom Line: A new binary option program pops up once an hour. They're all scams. There is no secret algorithm or program that can guarantee the outcome of what is essentially a coin flip. It's a scam designed to get $500 out of your wallet. Don't invest in any of these. Instead, learn how to build a real, sustainable stream of income online with our top recommendation. It's free to get started as well. Finally, a Binary Options system that I like! OK, to be fair I only like it because of its name: Kill Binary. I would love that we, as a community, could kill Binary Options systems off completely! Binary Options by themselves are not specifically a scam, though with them being high risk and 99.9% of them being based outside the US, they are not exactly confidence inspiring either. For me, it’s the Binary Options affiliates that are the problem. They float around the niche like scum on a pond, their sole focus being trying to get you to try a high risk trading system with the promises of riches. Not only that, but Binary Options affiliates tend to be the type of online marketers that give the rest of us a bad name. More often than not they simply just lie. The core of the sales pitch is the sales video. The video is a faux (that’s a fancy word for fake) news report hosted by a lovely blonde Brit who’s acting career is obviously floundering. I love the efforts that these marketers go to, I mean, they spend money on making a fake new report. As always though, there are cracks, such as this “live” broadcast having noticeable cuts and edits. The American, John, who apparently is there to prove the effectiveness of the system, provides a typical sob story one that is designed to make you feel sorry for him, feel amazed by his sudden wealth and wonder if it’s something that can happen to you. It’s a shame none of this is real though isn’t it? It would be lovely to think of someone making their way from nothing up to a high quality of living. Don’t get me wrong, I know for a fact that it’s possible. I just don’t think it’s possible with Kill Binary. It goes on and on with fake testimonials and more lies about how this is a special algorithm created just for Binary Options. It’s like spot the difference but reversed. It amazes me how many one of a kind, world changing algorithms there are out there nowadays. I’m quite surprised the Binary Options market hasn’t crashed due to this. The sales pitch continues by stating that there are only limited spaces available. I appreciate that the site doesn’t fake this by having a countdown that will just reset when you refresh the page, but let’s be honest here, the scarcity tactic is just that: a tactic. How do I know this? 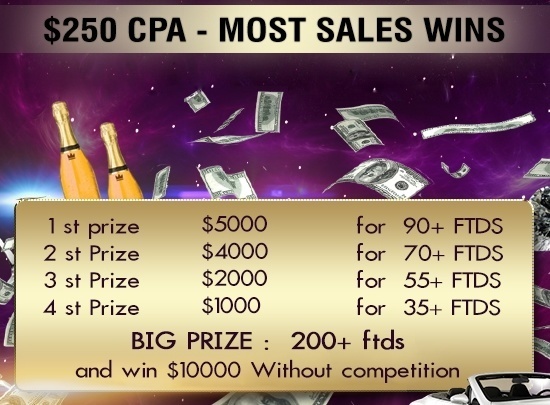 Well the affiliate page for the site (yes, affiliates of affiliates…) lets me know that if I send over 90 successful leads, I will win $5000. If I send over 200, then I win $10,000! All of a sudden I’m thinking being an affiliate of an affiliate is more profitable than the Binary Options system. Then we have the live trade data. This information comes from the mysterious BinaryBonus.net, an elusive site that provides trade data to a large number of Binary Options affiliates. It’s so secretive, that I cannot be sure if the data is real or not. However, by examining the fact that it is highly secretive with no public facing website or information, I have to come to the conclusion that this is a less than legitimate website. This in turn makes any trade data supplied by them to be suspect as well. I love the huge text added to the site that says this is a risk free venture, when the FTC confirms that Binary Options is a very high risk venture indeed. Oh and Kill Binary has no FTC warning or terms attached that I could see. Kill Binary also states that 100% of the profits are yours. Kill Binary might not take a slice of your winnings, but the Binary Options brokers you have to sign up with always take a chunk of your winnings. In this particular instance the broker’s states that “You can earn up to %70 profit returns on your investments”. Not quite all the profits is it? Talking of the broker, the one that you will be signed up with is called Titan Trade. I recently spoke about this broker regarding another product Alpha Fund Software, and I determined that they are a “decidedly dodgy outfit”. This particular Binary Options system, is yet another one off the cookie cutter factory that pumps these out. It uses bad actors and lies to encourage your greed and desperation and make you sign up and hand over your cash. Binary Options is high risk, with potentially very little reward unless of course you promote Binary Options, in which case it is highly lucrative from pushing hundreds or thousands of people into the wrong direction to make money online.